While the vet and the owner are hoping that the adage "This too shall pass" is true, and that the vet can get it to pass without surgery, I would bet that the tortoise is probably hoping so more than either of them. Of course the tortoise probably also is hoping for it to pass quickly. The odds are against that happening quickly though, I mean have you ever heard of a fast turtle? While it may be true that this too shall pass, it seems it will pass only very slowly at that. At the Long Island Reptile Expo, held last Sunday, a few families approached the Long Island Herpetological Society's (LIHS) table with the same question: 'Does the LIHS offer a children's program?'. While we had to answer no to that specific question, we reminded folks that we are a family friendly society. However, I had some communication with John H, one of the board members, during the past week and I brought up the subject. He informed me that the idea of a children's program has been discussed by the LIHS executive board in the past and that apparently the stumbling block was the lack of volunteers to run it. I told John I would do it but only if we can get another dedicated LIHS member to volunteer. Today, at the LIHS monthly meeting, John brought it up and asked for volunteers. Tara F volunteered and it looks as if the program will be taking off soon. In addition, John made a motion to the board to funnel a couple of hundred dollars into the program from the LIHS treasury. They voted on it immediately and all of the board members who were present voted in favor of it. Tara and I spoke about it a bit and we will be brainstorming to see what ideas we can come up with for fun things for the LIHS kids to do and how to incorporate them into the program. We did not name the program but I think that The LIHS Tadpoles might be in order or we could just call it LIHS Kids but I will run that by Tara and the board at a later date. Tara and I also discussed timing and we think we can get the program up and running by the January LIHS meeting. We will probably discuss it further with the membership at the November and/or December meetings. Speaking of the membership, we will be looking for temporary volunteers to participate once we get it up and running. We may need help with field trips, transportation, helping to keep and eye on the kids and so on. We don't expect any one person to volunteer for every event we have planned with the youngsters but maybe to volunteer just for an individual event now and again. If you think you might have an interest, let us know. Of course, if we go on a field trip, say maybe to the zoo or field herping, we would ask at least some of the parents to help with those. We have not discussed the age of the children yet, which is another thing to consider. I am going to guess that younger children who are under a certain age will always have to have a parent present and that kids over a certain age may be allowed to join in the kids' group activities without a parent remaining present so long as they are well behaved and respectful. It is another thing we need to discuss between Tara, the board and myself. As I said though, we will figure it out as we move between now and the January meeting when we expect to commence the program. So far, I have pretty much been writing this for the adults - now let me get to wrting something for you who will make up the program - you LIHS kids. We need to know if you are interested in this program. If you are, you can give us some ideas for programs and events you think would be fun. So far we have a few ideas but more would be better. Some possibilities are a zoo trip, a field herping trip, animal feedings, show and tell with live reptiles & amphibians, a take care of a herp for a month foster type program, vivarium building and a herp photo contest. If you can think of anything else that might be fun, let us know. You can either leave a comment to this post, send me an email (via the link in the profile for the blog), or send Tara F an email via the link under Executive Board on the LIHS website. We will try to let you know more about the LIHS kids' program by the December meeting (holiday party) at the latest. Tara and I are looking forward to making LIHS meetings much more fun for our younger members! Just a reminder that the regularly scheduled monthly meeting of the Long Island Herpetological Society is being held today - Sunday, October 26th - and runs from 1PM to 4PM in the Conference Center at SUNY Farmingdale. For directions to the school, click on this link. 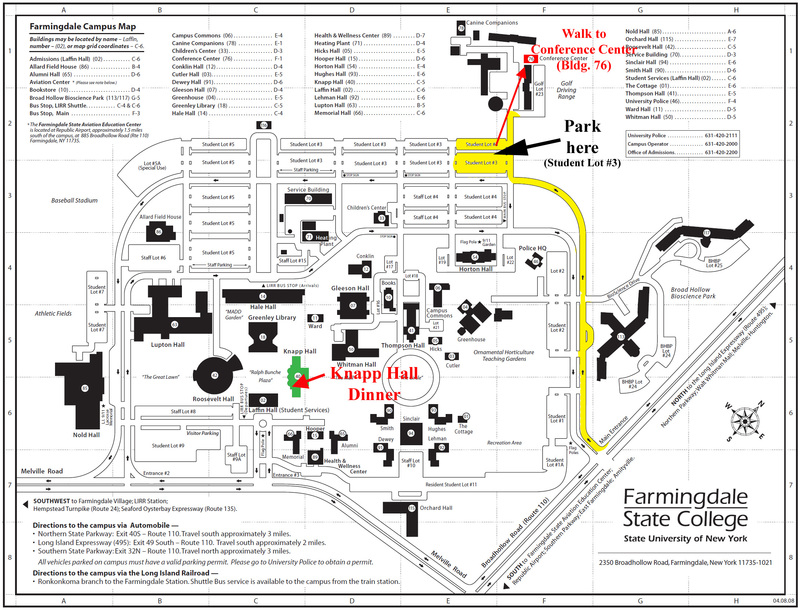 For a campus map showing the location of the Conference Center click here. The presentation today will be on Corn Snake Morphs and will be given by the esteemed corn snake breeder - Rich Hume. This will be your last chance, for this meeting year, to nominate someone for the LIHS Executive board. Elections are scheduled for next month's meeting. As usual, there should be animals on display during the meeting and likely will be some up for sale and or adoption. As usual, the meeting is open to the public and admission is free. More on the LIHS here: www.lihs.org. The October meeting of the Long Island Herpetological Society is scheduled for this coming Sunday, October 26th at 1PM, in the Conference Center at SUNY Farmingdale off route 110. For directions to the school, click on this link. For a campus map showing the location of the Conference Center click here. As usual, this meeting is open to the public and all are welcome to attend. The speaker for this meeting will be LIHS member Rich Hume who will give a presentation on Corn Snake Morphs. As usual, Rich should have some really nice snakes on exhibit for his talk. In addition, this meeting should conclude nominations for LIHS board member positions. If you want to run for a spot on the LIHS executive board, make sure to come to the meeting, likewise if you want to nominate someone. If you are happy with the LIHS and the way it is being run, then you don't need nominate anyone as the first nominations at the September meeting wound up in having all existing board members, save I think one who resigned, nominated for reelection. If you want to see some changes, then October is your last chance to nominate someone for the upcoming election in November. ...should be obvious from the video at the link below. That some people are, at least in my opinion, pretty much absolute idiots in how they feed their herps should also be easy to grasp while watching it. I just figure there is no way that a mouse that size should have been fed to a frog that small (and you will note that the video does not show the frog being completely eaten, maybe because the frog could not get it all down). It also probably would have been much wiser to have used a dead mouse to avoid a couple of things like the mouse's obvious unnecessary suffering and the frog being bitten by the mouse. I am certainly not an animals rights extremist (not even a moderate) but I have respect for animals and would much rather feed a dead mouse, that had been dispatched rapidly, to a herp instead of watching it suffer, if indeed the herp would accept a dead mouse. In this case, the mouse was simply a ridiculous for a frog that size and to me it seems that the video was made for the shock value or wow factor of it. I think most people get passed that stage of their lives and rise above such insensitive immaturity, as to get a rise out of stuff like that, when about 12 or 13 years old. Then again, some of us never grow up. I link to the video here only to demonstrate a terrible way to feed a frog. You should avoid doing likewise. Video submitted by Deb H, my thanks to her for it. 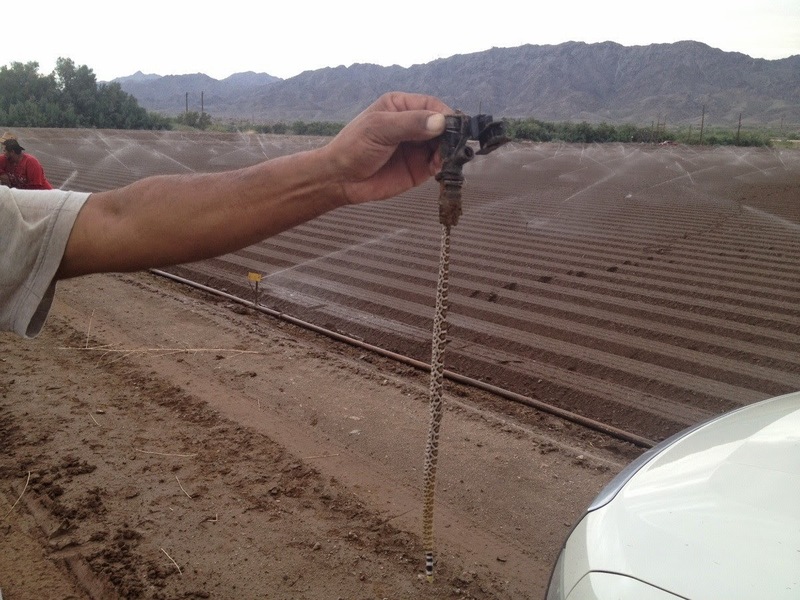 ...and when it was inspected just look at what was found to have been plugging I up. Submitted by LIHS member and contributor extraordinaire Deb H, my thanks to her. There was another Long Island Reptile Expo at the Hilton in Melville, NY today. As usual the Long Island Herpetological Society was represented by a fair number of LIHS members. Both Harry F and myself manned the LIHS table for the day and Vin R (and his daughters), Rich H, John H and Tim (?) had space at the adjoining tables. While Harry and I kept busy trying to drum up new LIHS members, the other guys were busy selling herps from there tables. Other members at the show included Mike V, Tony C, Mike R, Chris M, Dave F and Tara N (hope I did not forget anyone). As usual there were good deals to be found on herps, herp accessories and equipment and on feeders. There was a pretty good variety of both reptiles and amphibians but as Harry F pointed out there seemed to be a dearth of water turtles. The customers came and went throughout the day and it looked as if it was busier mid show than at the beginning and certainly was busier then than near 3PM which was closing time. As for visitors to the LIHS table, there were quite a few folks who stopped by. I think we usually get more inquiries about herps and herp care than about memberships but this time seemed just the opposite to me. We had several people stop by for membership information which could wind up being a good thing in the form of increased LIHS membership. At least two and I think three families stopped by to inquire about memberships and whether or not we had any sort of children's programs. I imagine, if we get enough interest we could set some sort of program up for our younger members. I would definitely be willing to help out with that and if anyone else among the membership is willing, please let me know and I will bring it up to the board members. This expo, or so I heard, will have been the last one held at the Hilton on Route 110. The next one is supposedly going to be held at a location further east - Suffolk County Community College which is just off of exit 53 on the LIE. That one is scheduled for Marc 15, 2015. Of course, the NY Reptile Expos/Shows are still being held in White Plains. Hope to see you at the show in March. It gets more complex because the same guy and an accomplice were reportedly arrested in September too - the charge - more turtle smuggling. Thanks to Mike G for sending me that info. It looks as if the monitor may have dinner, in the form of the bearded dragon, on its mind and I can almost hear it thinking: "Oh boy am I actually gonna catch this tasty morsel?" 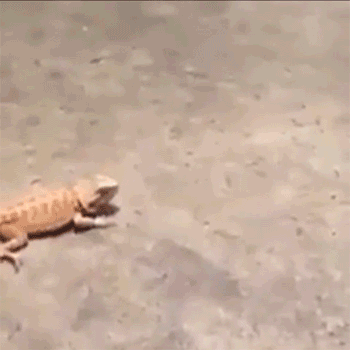 Luckily, the beardie had an answer already prepared: "NOPE!"